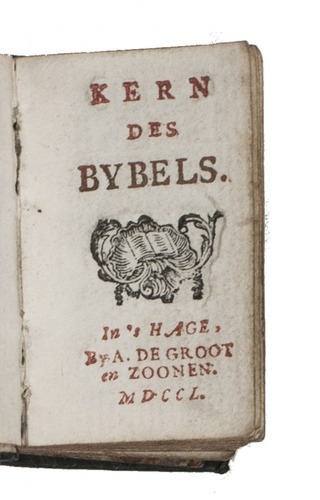 [BIBLE - DUTCH - MINIATURE]. The Hague, Antony de Groot and sons, 1750. 128mo (binding 4.5 x 3.0 x 1.0 cm). With text printed in gold, title-page printed in gold, red and black with woodcut device, woodcut frontispiece, 6 full-page (3.3 x 1.6 mm!) woodcut illustrations, and headpieces built up from fleurons. The drop-titles of the five chapters and the appendix are printed in red, as is the fleuron used as a tailpiece at the end of each. 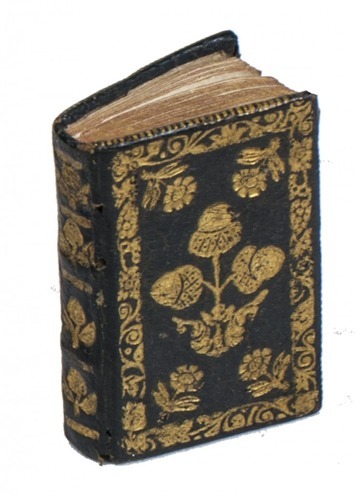 Contemporary richly gold-tooled black morocco by the so-called first "stadhouderlijke" bindery, gilt edges. First edition (deluxe issue, with the text printed in gold) of one of the smallest Bibles of its time. It gives an abbreviated version of the Old and New Testament, followed by an appendix with "Godtvrugtige overdenkingen" (devout contemplations). 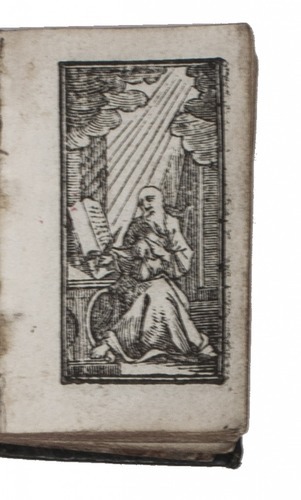 The frontispiece shows St. Jerome, the next five woodcuts show biblical scenes (one preceding each of the five chapters) and that before the appendix shows a man praying. The present copy is beautifully bound by "the most important bindery working in the eighteenth-century Netherlands", called the stadhouderlijke bindery because of the work it executed for the Dutch heads of state Willem IV and Willem V, Princes of Orange. 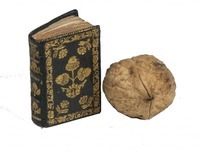 The centrepiece on the present binding is their lovely three acorn stamp. With the tiny bookplate of the well-known art and book collector Hannah D. Rabinowitz, widow of Louis Mayer Rabinowitz (1887-1957), a notable collector himself. Lacking the opening flyleaf, one quire nearly detached and a tiny smudge in the gutter margin of the last page, otherwise in very good condition. Binding with three tiny wormholes, but otherwise also very good. Adomeit, Thumb bibles C15; Poortman I, p. 248; for the bindery & tools: Storm van Leeuwen, Haagse boekband, pp. 55-73; Storm van Leeuwen, Dutch decorated dookbinding IIA, pp. 67-101.